Is that why Tilly and The Wall grabbed me so firmly from the first listen? I just recently got a hold of their 2006 album, Bottoms of Barrels. It made me so happy. It reminded me of Belly, or The Lemonheads, or even The La's...The upbeat but slightly underground and always witty music I loved to listen to so long ago. They've added a drumset to the sound, where previously percussion was provided by one of the band members, listed as Tap Dancer! Acoustic guitar, keyboard, and the multi-layered sound of the members' voices and claps had traditionally rounded out the presentation, but again, electric guitar can definitely be heard in the new recordings. In June of this year, they released a third album, called o, which is harder and faster and louder... This reminds me a bit of the angry and energetic commentary offered by bands like Garbage or Belly (oops... oh wait...) so it makes me happier still. I'm glad to find out that this band is still recording and touring. It's disappointing to discover "new music" only to find that the band is no longer together. 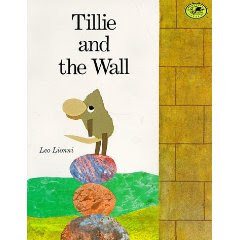 The band got the inspiration for their name from a children's book written in 1989 about a mouse who seeks to find out what is behind the wall that all the other mice barely acknowledge as simply something that is a part of their everyday existence. I love the indie ethos that this band proves they have, not only with the selection of their name, but also with the self-recording and launching of their first release, "Woo! ", prior to debuting their first LP Wild Like Children in 2004, which was the first album released on a former bandmember's label. They played at Coachella 2007 and have tour dates across the Western U.S. throughout September. I'm about to become a Tilly Kid. Come along for the ride. Sometimes you just can't hold back the river.